This example, though certainly sounding paranormal, is in truth not as far-fetched as one might initially think. Today, it is a common practice for many computer manufacturers to utilize crystals for the distinct purpose of information storage. In fact, NASA has been using similar technology since the early days of the Space Shuttle Program. The fact that crystalline growth is able to imprint information directly to itself is certainly an intriguing idea, especially when this idea is connected to the concept of ghosts and hauntings. As these computer companies understand that data information can be etched to crystal-based foundations of data chips through sonic and similar vibration methods, it should not be too difficult to accept the Stone Tape Theory as a plausible concept. Dr. William G. Roll, famed parapsychologist and professor with the State University of West Georgia, Department of Psychology, as well as a member of the Parapsychological Association believes that this concept is essentially based on the idea that buildings and materials are able to absorb various forms of energy from living beings, including animals. Though researchers speculate that the recording is laid down during times of high emotional stress, such as a murder, suicide or from other forms of grief, many feel that any form of emotional energy, such as happy occasions, like a banquet, a birthday party, for instance, or even a romance between two lovers can also be stored for an unspecified amount of time, and then replayed when some aspect of the witnesses personality or psychic being is triggered. Dr. Roll continues to say that such attributes may include psychic ability, various forms of stress or even brainwaves that seem to set off the recording like a “psychic video.” Such replays may take a form of a full, ghostly manifestation or even through sounds such as voices or footsteps. The more we consider this theory, the more it appears to explain many of the sightings and incidents that occur. In recent years, the possibility that this type of haunting may be more akin to natural electric and/or magnetic fields could be another method of information storage, concluding that electromagnetic fields may in themselves be a conveyance for said recorded information. If this is true, then we must consider the popular ghost hunting methods, such as the use of the Electromagnetic Field detectors (EMF) or via Electronic Voice Phenomena (EVP), as at least in the realm of possibility to that of mere fantasy. As each of the aforementioned examples of events is typical in the realm of psychical research, specifically that of ghost and hauntings, we must ask the question: Are all haunting events related in one way or another to the Stone Tape Theory? 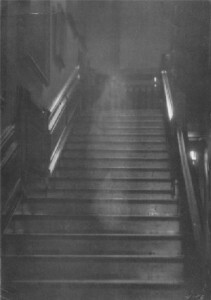 Though many feel there is a sentience to some ghosts and apparitions, whereby the spirit in question is aware of his/her situation and surroundings, being conscious of feelings and moods, the Stone Tape Theory appears to fall within a more logical place setting within psychical research, yet does not dismiss the later theory. If ghosts are indeed residual in nature, and not actively sentient, then we must at least consider the more astute foundation of these events as scientific in nature, simply needing to be classified as such. Because the concept of something being ‘residual,’ such as the scent of burning wood being olfactory-observed long after the wood in question is long gone, and which is an accepted fact with the scientific community, we must at least consider this idea as applied to something yet unidentified. If this theory applied to psychical or paranormal research is indeed true, then we must also consider the aforementioned theory that various emotional vibrations; both sensory and physical-based, may be a plausible explanation.